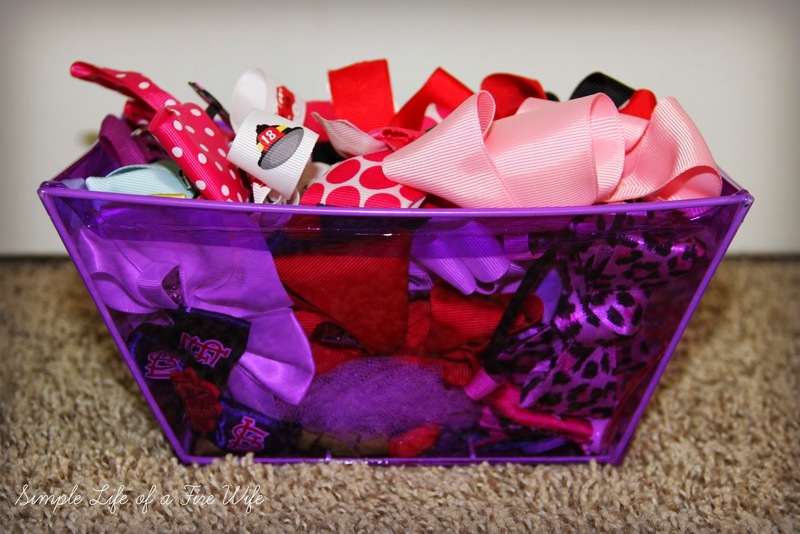 Bows, Bands, and Clips...OH MY! 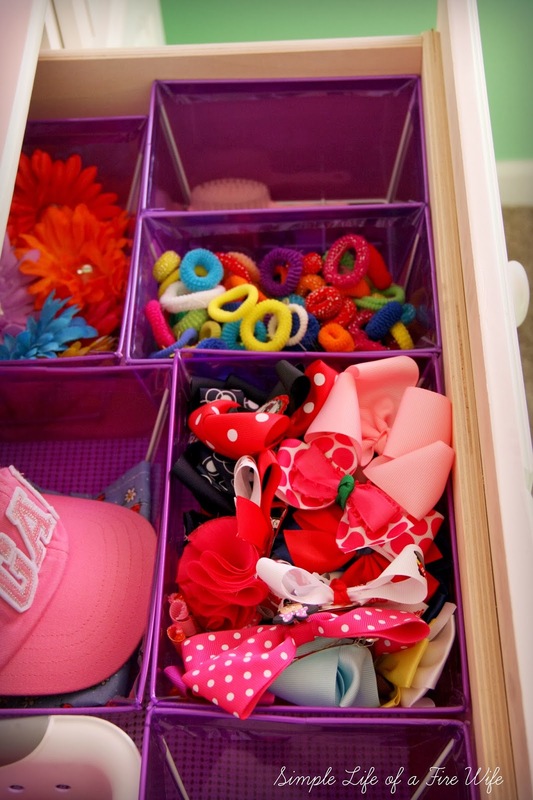 I LOVE all the fun bows, flowers, clips, and headbands that come along with having little girls! How quickly they can pile up though! 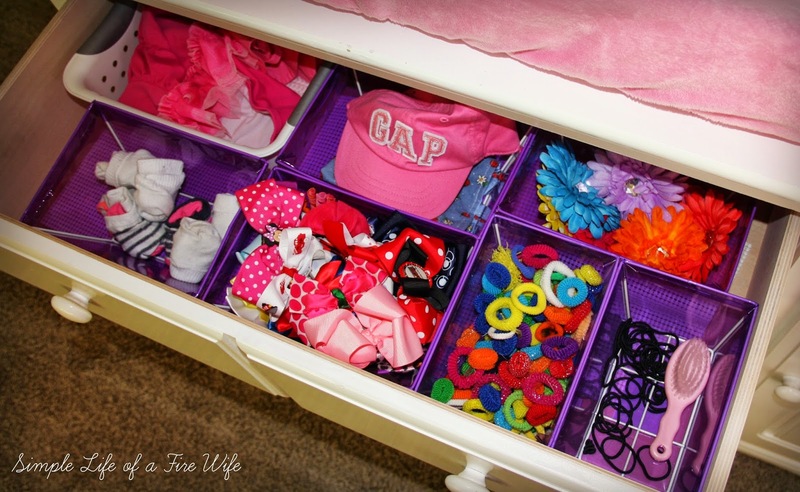 Here is a look at how I keep it all organized! 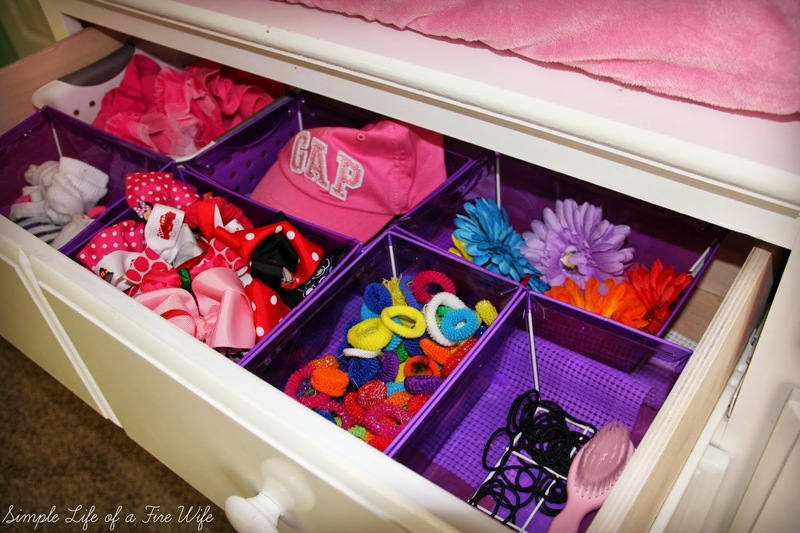 This is the top drawer of her dresser. The far left has socks and swim stuff, but the rest is all for hair. 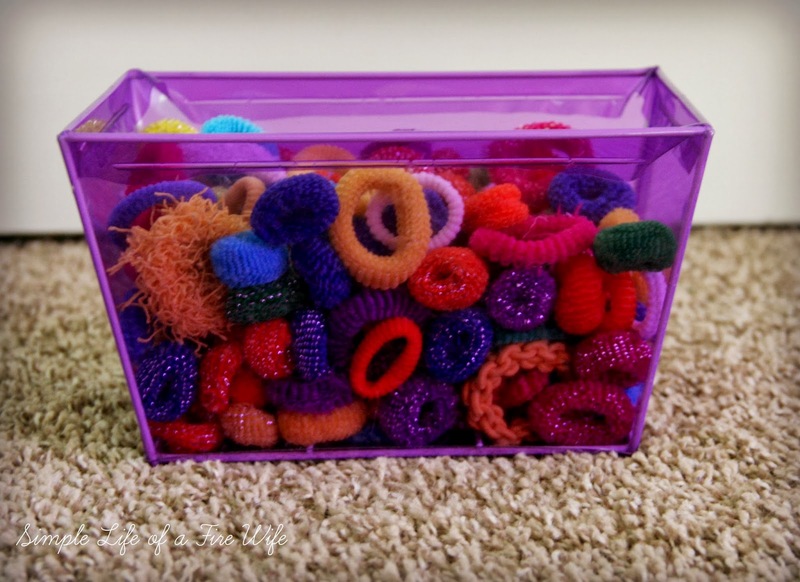 I got the purple bins at Dollar Tree a while back and they are great! 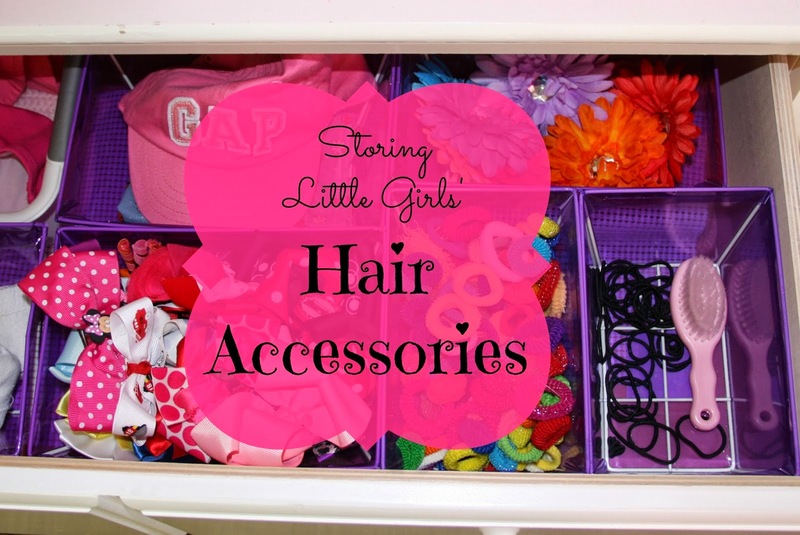 They come in a couple different sizes and have worked so well for keeping all of her hair supplies. I did add a non-slip pad on the bottom of the drawer because they did slide around otherwise-even with the way I have them packed in there! 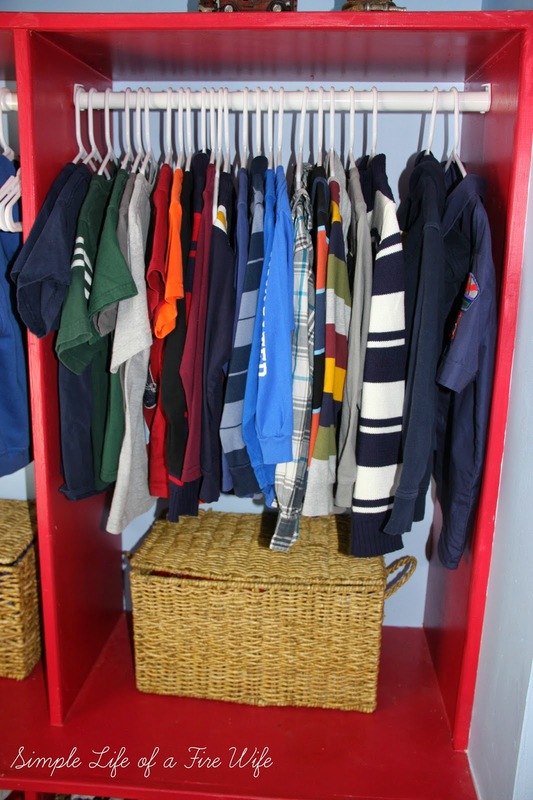 We have struggled with our boys' closet since we moved into this house almost 2 years ago. Our boys, now 8 & 6 share not a tiny, but certainly not a large room. The former owners had built in this sort of open locker system into the closet. It didn't seem like it would work well for us at the time, so we stuck with the dressers the boys had and this space was basically being wasted. The shelf had books and other random little things they would put on it, but basically, totally wasted space. A few months ago our boys decided that they no longer wanted their bunk beds to be bunked. So we took them down and gave them each their own nightstand and they were happy. I on the other hand, was not so happy. With the beds no longer bunked, there was not much space left in the room. Their dressers were also not functioning well for them as they were growing older. I decided that we could no longer afford to not be utilizing the closet space. 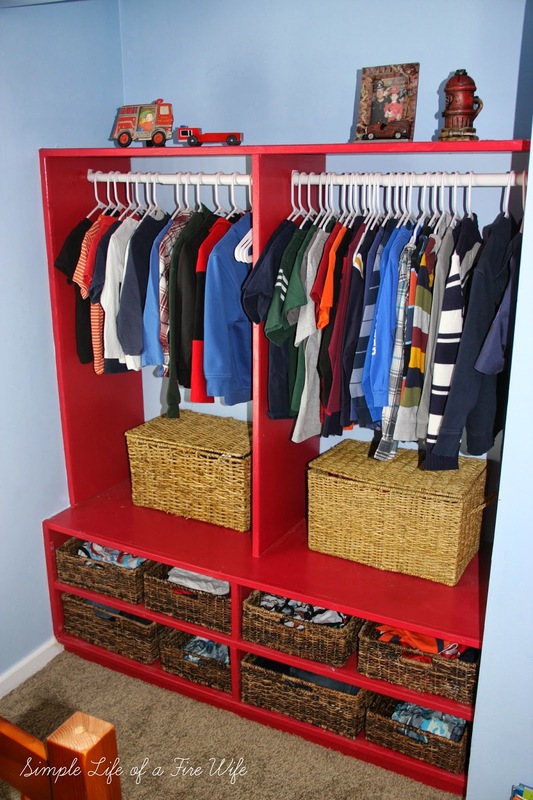 Ideally I wanted to rip out the whole 'locker' system and do a custom organizer that would work well for 2 kids. Unfortunately this wasn't an option since the carpet does not go under the bottom of the current unit. I had to figure out a way to just make it work. After some frustration thinking we finally came up with something that works great! 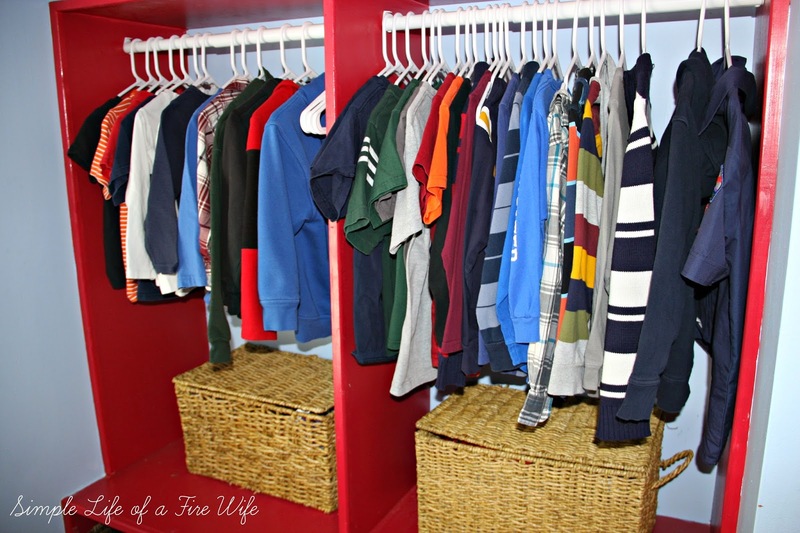 I had my husband install hanging rods onto each side of the lockers. Nothing fancy, just cheap, adjustable rods that are mounted into the side walls. All shirts are hung up there. After carefully measuring the shelves on the bottom, we set out for Michael's in search of some baskets. Not such an easy task when you are needing a large number of matching baskets with a specific amount of space to fit into!! After a long, and loud (we had all 4 kids with us...) trip, we finally ended up with the perfect set! Some bigger for pants, some smaller for things like swim suits, etc. 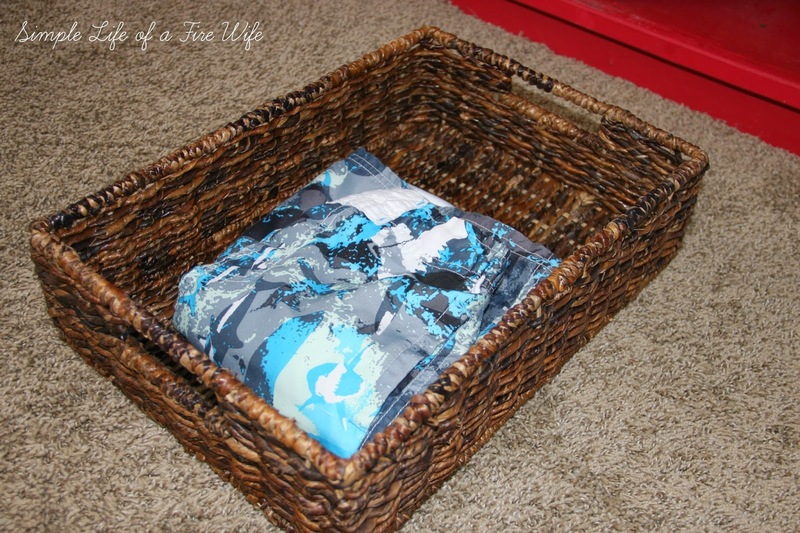 We already had one of these baskets with a lid, so I checked when we were at Michael's and found a matching one and keep each kid's pajamas in them. 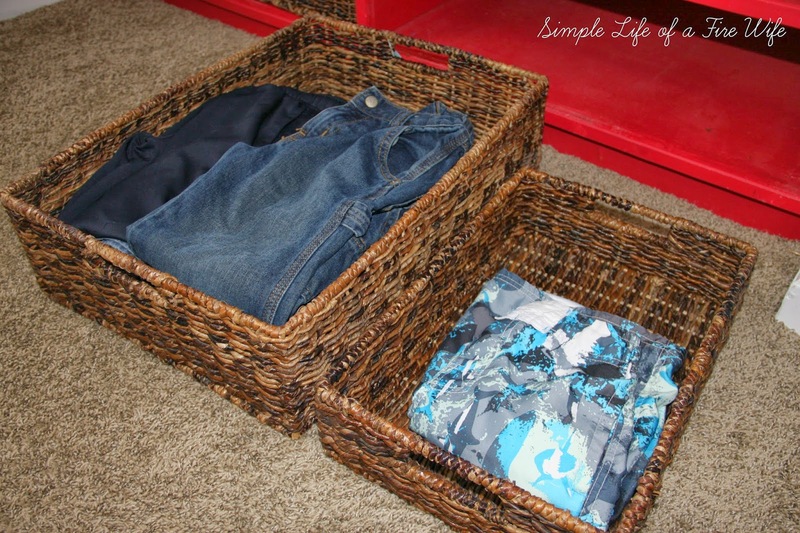 Works great to hold those heavier winter pajamas! Here's how it all turned out. 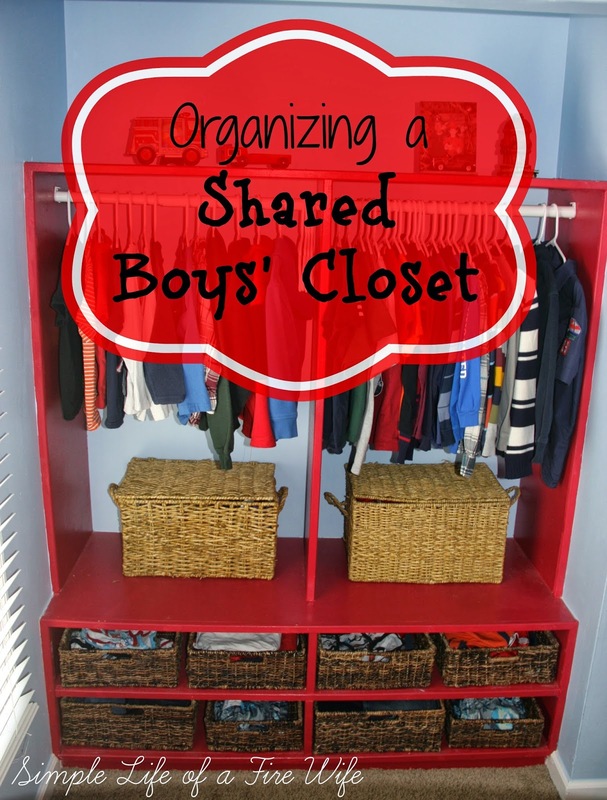 Each boy has their own side of the closet. It is working great and the boys love it! Best of all, we were able to get the two dressers out of their room and free up some space in there! I couldn't be more pleased with how it turned out! 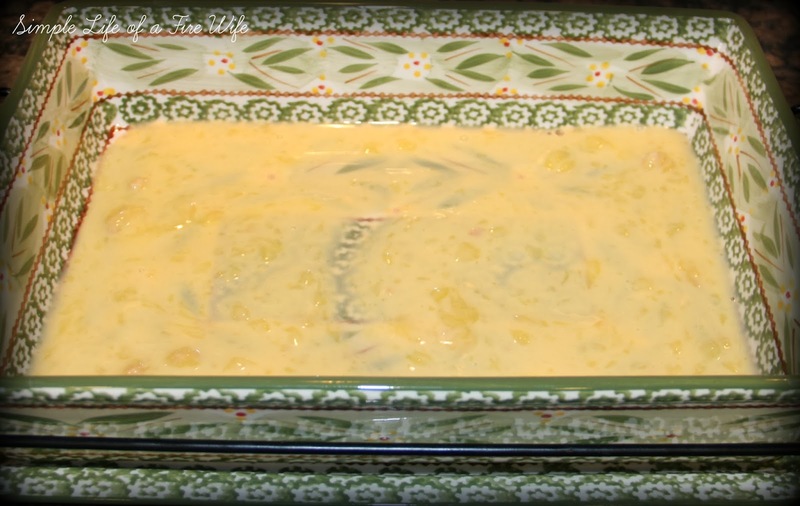 Mix soup, water, and Velveeta in a microwavable bowl. 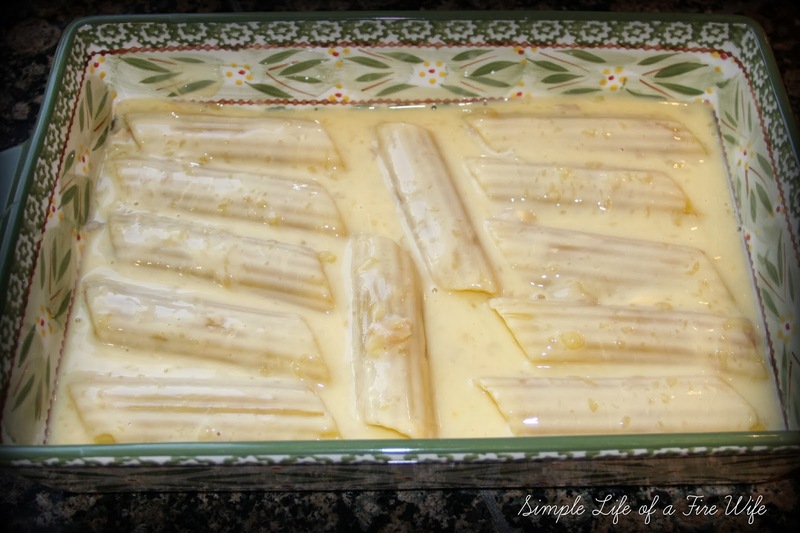 Microwave on high for 4 minutes, stopping to stir half way through. 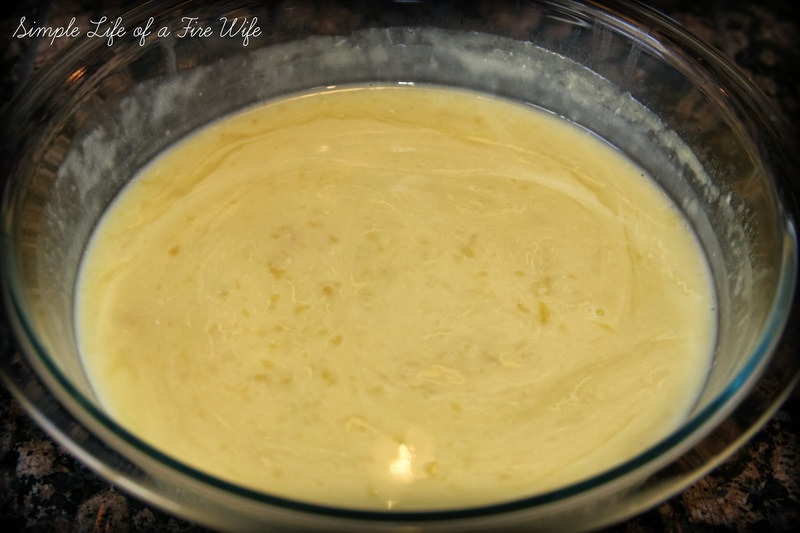 Cover the bottom of a 9x13 baking dish with some of the mixture. 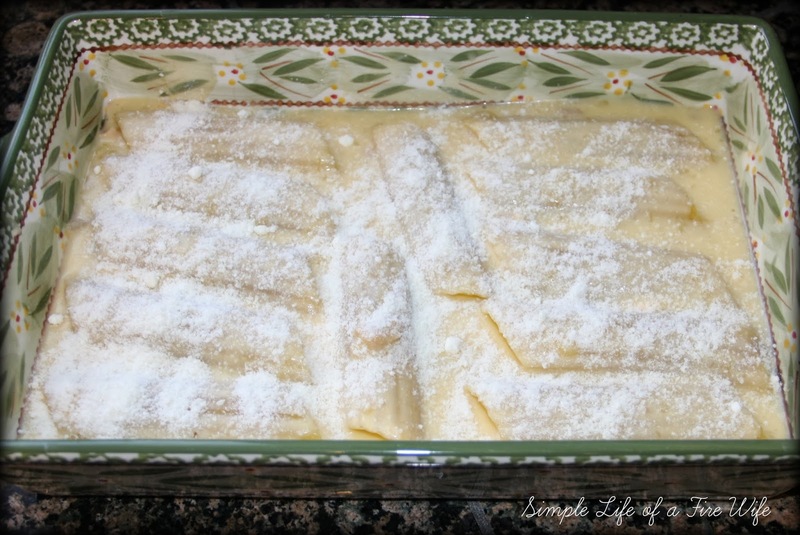 Stuff pasta with chicken strips and line up in the dish. 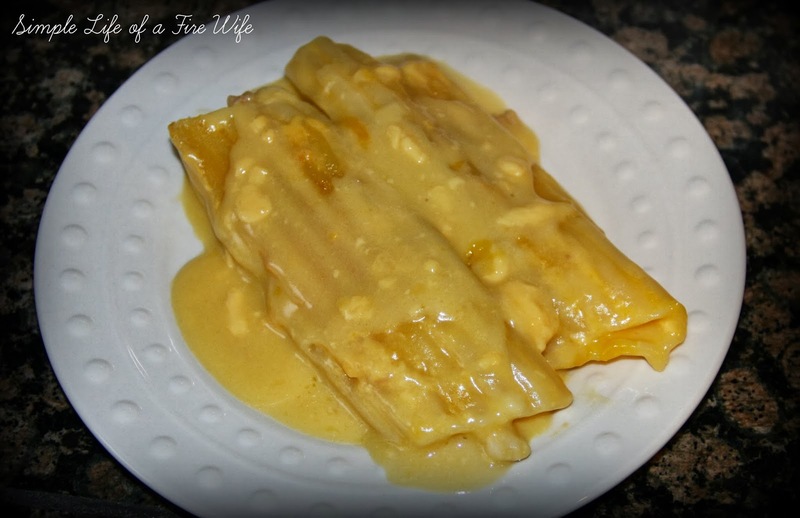 Cover pasta with remaining sauce mixture. 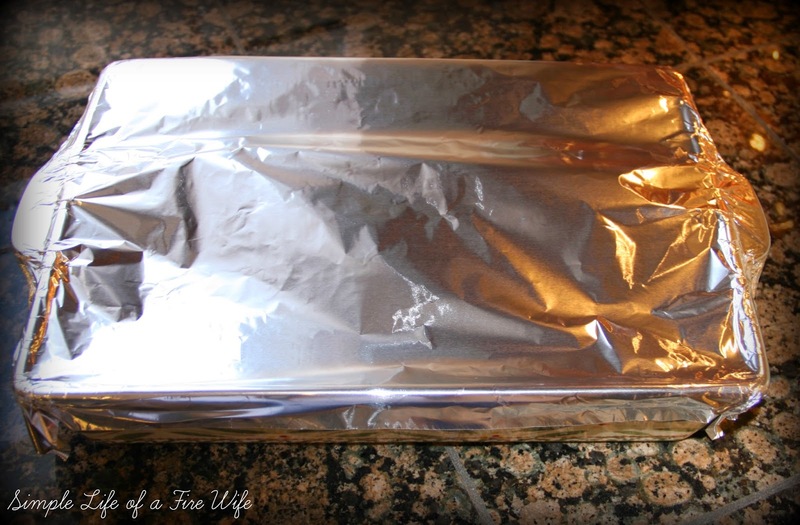 Cover with foil and bake for 45-50 minutes. 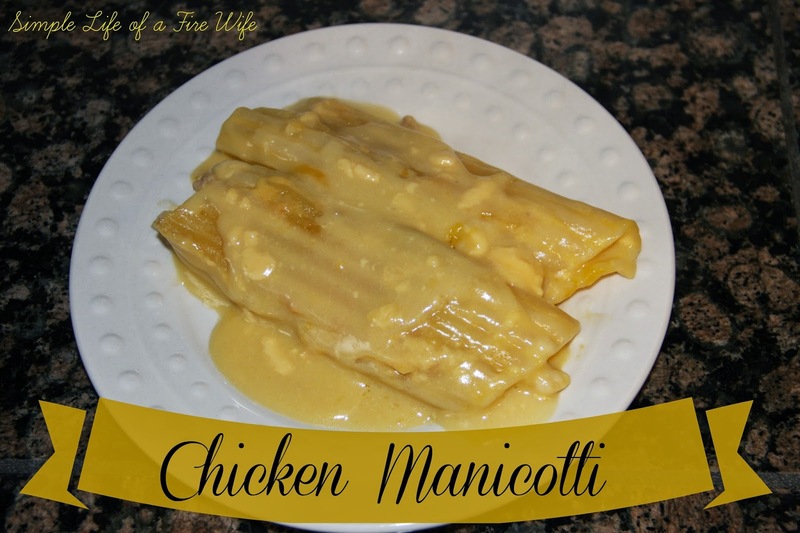 I like to keep the sides simple so I usually do some frozen vegetables and garlic bread to go with it.